Teachers at Westwood Elementary School in Broken Arrow, Oklahoma, found the perfect reward for their students, who read 4,500 books! They organized a Literature Day. Then they did the whole thing over again at night -- so they could include families! Included: Activity ideas and tips for organizing your own literature event! Sometimes a school comes together to create a truly special activity that benefits every child -- and every family too! Such was the case at Westwood Elementary School in Broken Arrow, Oklahoma. Each October, the state of Oklahoma encourages school principals to challenge their students to read a targeted number of books. "One year, our Reading Committee suggested I challenge the 476 students in our K-5 school to read 4,300 books," says Mary Ellen Imbo, Westwood Elementary's principal. "Every year we raise the bar on the number, and the students exceed it," she adds. And that year was no exception. The students read 4,500 books! So what was the payoff to students for meeting their goal? As a reward, every teacher and student at Westwood dressed up as a storybook character for a fun, school-wide Literature Day! The special day was planned by the members of the school's Reading Committee and by each classroom teacher. And principal Imbo led the way, dressing up as and reading "Sarah Cynthia Silvia Stout" (by Shel Silverstein) at an assembly! But that was just the start of the fun! After the assembly, students went to a classroom of their choice to listen to a pre-selected story and to participate in related hands-on activities. "For example," Imbo recalls, still marveling at how Literature Day came together, "one teacher read Casey at the Bat. The students then got on the Internet and played baseball on a Web site. Westwood's art teacher read the biography of Jackson Pollack and followed with an activity in which students dripped different colored paints onto a canvas." "That canvas is being framed to hang in our main hallway," Imbo adds, "and each student who participated has signed it." "Won't it be fun for those 'artists' to see their work when they return to Westwood as high school seniors?" adds Imbo. Each year the school hosts a reception for alumni about a month before they graduate from high school. But that wasn't the end of it -- Literature Day became Family Literacy Night! "Students chose a different story activity from the one they'd participated in during the day and they took their parents to that classroom," says Imbo. PARENTS AND TEACHERS LOVED LITERACY NIGHT! "Literacy night was such a fun evening for parents as well as children," said Pam Roberts, the parent of a third grader. "This special night was such an innovative way to interest children in reading. I hope we do it again soon." "Awesome!" said parent Cheryl Vaughan, whose son is a fifth grader. 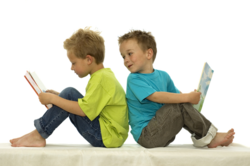 "It was a great time for parents to show their kids their own love of reading. It was also a good chance to mingle with other parents and students who share an interest in literacy. I would encourage all schools to do this." "This activity was particularly good for parents because they were able to observe teachers modeling effective read-aloud techniques," adds Imbo. "Additionally, they were able to observe the teacher's instructional strategies." Teachers felt the experience was valuable for them too. "It was fun to get to work with students at different grade levels at the same time and to watch parents work with children in a classroom setting on something they both were enjoying," said teacher Cynthia Delay. "This was truly a bonding experience for students and teachers," observed teacher Alice Keeney. And parents too! Literature Day took a great deal of planning -- and shopping! "The total cost of the supplies we used for the entire day was about $150," recalls Imbo. "Our assistant principal, reading specialist, and media specialist did most of the shopping, paperwork, scheduling, and promotion." Activities were organized to appeal to students in K-2 or 3-5. Each activity session was planned to run from 45-60 minutes. Teachers filled out an activity planning sheet that included the grade level for the activity; the book to be used (title, author, illustrator, publisher, and copyright); a list of needed supplies; and a brief description of the plan. Each plan included an intro discussion, an activity, and a conclusion. Among the activities teachers planned were cooking, movement, arts and crafts, music, drama, game playing, and writing. The teachers' plan sheets were compiled and are on file in the media center for future use. Signup for evening activities took place before the PTA meeting that preceded the literature activities. Each session was limited to 15 children and 15 parents. Casey at the Bat by Ernest L. Thayer. The session started with a brief discussion of team playing and giving one's best. Then the teacher read the book while the audience ate peanuts and Cracker Jacks. When the story was finished, everybody sang "Take Me Out to the Ballgame." Then participants played a computer baseball game on the Internet. They also had time to make a pennant for their favorite team. The teacher (grade 3) wore her son's baseball team shirt and a ball cap. Trees. The opening discussion centered on the importance of trees in our lives. Then the teacher read two poems about trees ("Trees" by Joyce Kilmer and "Trees" by Harry Behn). Participants then took an Internet field trip through some of our National Parks and, for an art activity, made trees with leaves of tissue paper. The group enjoyed a taste-testing party of foods that come from trees -- including orange juice, apple slices, bananas, and Almond Joys. The teacher (grade 3) dressed in brown from head to toe. The Rainbow Fish by Marcus Pfister. Participants paired up and shared three positive characteristics of a friend. After reading the story about a lonely fish who figures out how to make friends, participants created ocean scenes and covered them with blue cellophane. They ate a snack of rainbow cookies. The teacher (grade 1) dressed in rainbow colors. The True Story of the Three Little Pigs by Jon Scieszka. Participants shared what they recalled of the original "three pigs" story. Then they hissed and booed in all the appropriate places as they listened to Alexander tell his side of the story. Listeners chomped on pork rinds as the teacher read! Then they split into small groups and created their own versions of "The Three Little Somethings" and presented their interpretations for the rest of the group. The teacher (reading specialist) dressed up as the big bad wolf. "Bugs, Bugs" by Jack Prelutsky and The 512 Ants on Sullivan Street by Carol A. Losi. Participants discussed what they knew about ants' homes and habits. They also talked about making good choices and about consequences. After the book was read, participants sang "The Ants Go Marching One by One" and made fingerprint ants. For a snack, they ate "ants on a log" (celery filled with peanut butter, with raisins on top). The teacher (grade 2) dressed in all black and wore antennae. Look for a Bird by Edith Thacher Hurd. Participants went outside looking for birds to identify. Then the teacher (grade 4) read the book. As a follow-up, participants made birdhouses. For a snack, they made bird nests out of chocolate almond bars, Chinese noodles, and jellybeans. Clumsy Clown Willie by Morrell Gipson. 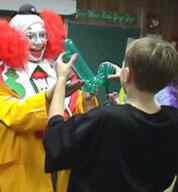 Participants shared their experiences with clowns at the start of the session. After the teacher read the book, everybody made animals out of long balloons. For a snack, they made clown ice cream cones. The teacher (grade 5) made and wore her own clown outfit. "What I enjoyed most about Literacy Night was watching the parents interact with the children on their levels," says Teresa Smith, a kindergarten teacher at Westwood. "They did everything from dancing like a bird to cooking chocolate bird nests. I think the parents actually had more fun than the children did!" "Literature Day was great!" adds teacher Linda Trobaugh. "It gave us a chance to share with children that reading really is fun."